6 children. At first Richard didn't prove to be 'the brightest lamp in the street.' His schoolmaster once reported him as being "disobedient, obstinate and slow", but, by the age of 19 he was learning the ropes and became an engineer. He also demonstrated that a ship could be made of iron. 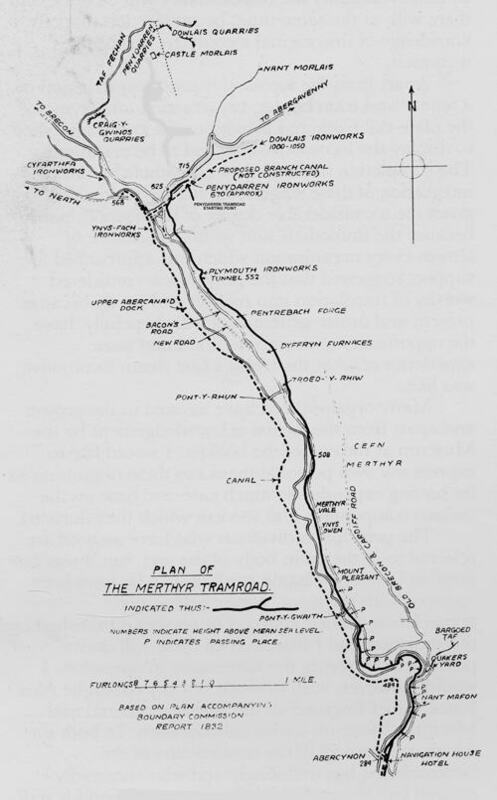 The Merthyr Tramway was built in 1802, and it's ownership was shared by the Dowlais, Penydarren and Plymouth ironworks. It ran from Merthyr to Abercynon, a distance of 91/2 Miles. Samuel Homfray, owner of the Penydarren Iron Works, Merthyr Tydfil, made a bet of 1,000 guineas with Richard Crawshay, owner of the Cyfarthfa Iron Works, that he would construct a steam engine to haul a load of 10 tons of iron from his works along the tramway, to Navigation House, Abercynon.The bet was accepted, and the work people became tremendously interested in the event. 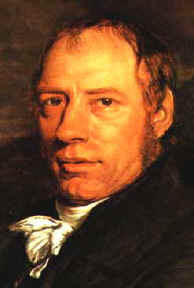 Homfray had the assistance of Cornishman Richard Trevithick, whose plan for a "High Pressure Tram-Engine" had earned the ironmasters support. Early in 1804 Trevithicks engine, with its single horizontal cylinder, 8 foot flywheel and long piston-rod, was ready, and February the 14th was chosen for the great test. People came from far and near to witness the great experiment. The five trams were loaded with the iron, and 70 men added themselves to the load. With shouts of encouragement, the engine started on it's journey. Unfortunately disaster soon struck, for the chimney of the locomotive struck a low bridge and both were destroyed. According to the terms of the wager Trevithick had to control and repair the engine unaided. 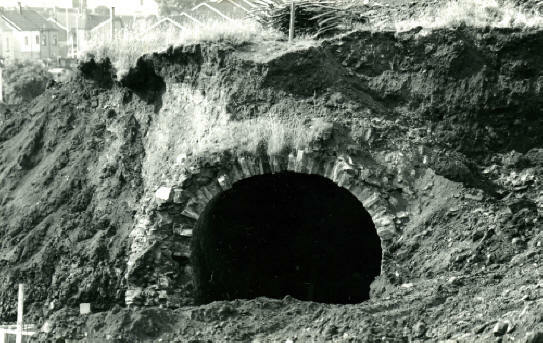 In a short time he had cleared the debris and repaired the chimney, and soon was careering along at a speed of five miles an hour to his destination at Abercynon, which was reached without further mishap. Due to the Steep gradients and sharp curves the engine failed to make the return journey even though it had no load, but it had been proven that Steam Locomotion was a possibility. 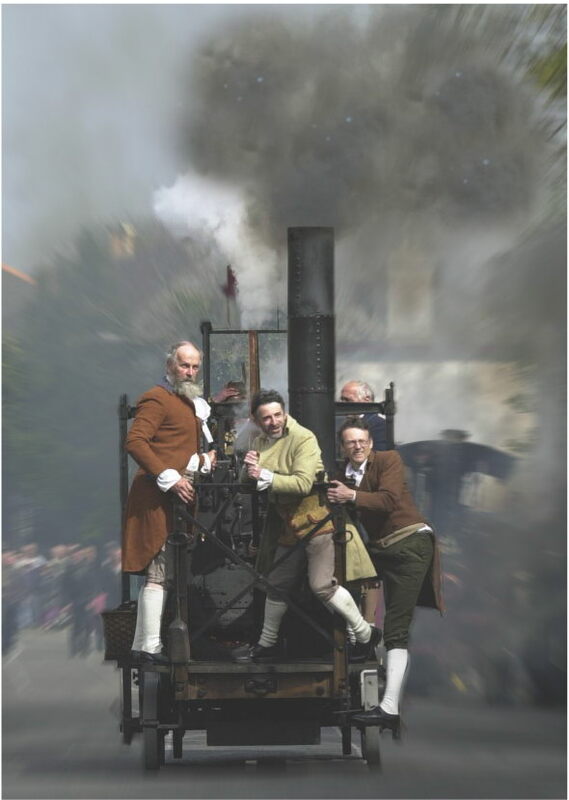 Trevithick's locomotive employed the very important principle of turning the exhaust steam up the chimney, so producing a draft which drew the hot gases from the fire more powerfully through the boiler. Trevithick was the real inventor of the locomotive. He was the first to prove the sufficiency of the adhesion of the wheels on the rails for all purposes of traction on lines of ordinary gradient, the first to make the return flue boiler, the first to use the steam jet in the chimney, and the first to couple all the wheels of the engine. tram road, and therefore upon the very spot over which the famous locomotive travelled..
Peter Price Emailed us his drawing of Trevithicks Steam Engine. Maritime Museum, shown here in front of Cyfarthfa Castle. the Royal Mint have struck this £2.00 coin. In 2004, Merthyr Tydfil Borough Council with funding from the Heritage Lottery Fund opened an exhibition to celebrate the achievements of this great man, Richard Trevithick.